Adorn your home with the modern look of the Eryk Collection accent chair by Sandy Wilson Home. 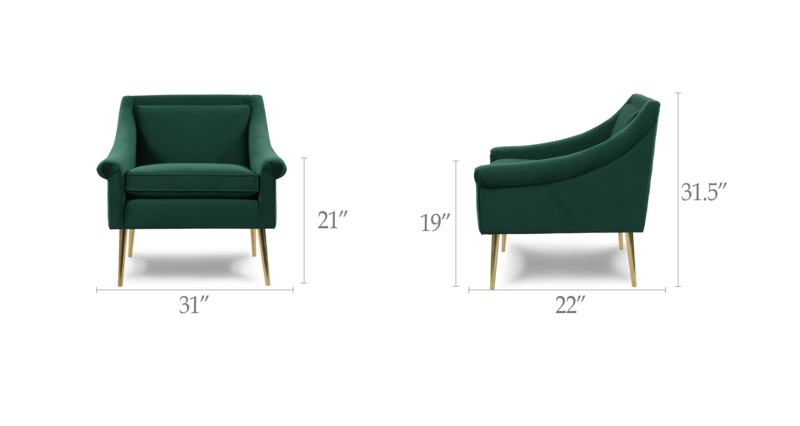 It features swooping rolled arms, tall Polished Gold metal legs, and rich luxurious velvet upholstery. As pleasing to the eyes as it is to sit in, the solid hand-crafted construction ensures you will be able to enjoy this beautiful chair for years to come. Look for the matching settee to create the perfect conversational set! Beautiful color and style. I only wish it were a bit taller. It adds a lovely touch to my updated master bedroom.